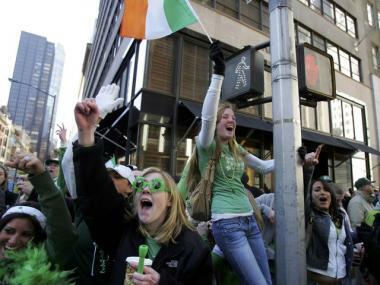 Despite a police crackdown on public drinking at this year’s St. Patrick’s Day Parade, revelers still sought to celebrate the alcohol-friendly holiday by swilling in the streets. Police issued 180 open-container violations to celebrants at Wednesday’s parade, a police source said. In addition, 30 arrests were made for everything from unruly behavior to unlicensed vending and peddling, police added. The annual event was led this year by Police Commissioner Raymond Kelly. This was the last year the parade took its traditional route along Fifth Avenue, from Midtown to the Upper East Side. The city will implement a cost-cutting measure beginning April 1 to reduce all parade routes by 25 percent.